Has one of the best internal coloured fruit of the five red fleshed varieties. Medium sized seedless fruit, smooth thin peel with dark red flesh, excellent quality. Harder to grow than other varieties. The deep-red flesh is juicy and easy to section, making it a great choice for breakfast, lunch or anytime. 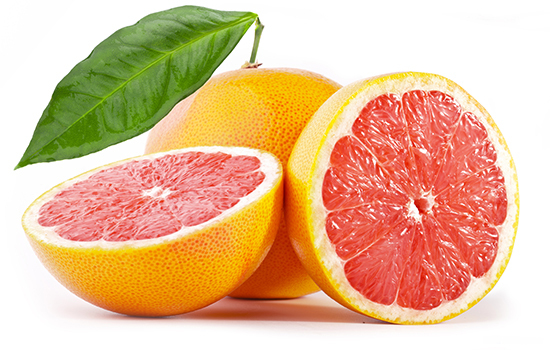 Choose grapefruit with bright smooth thin unblemished skin. The grapefruit should be very heavy for its size, as it will be the juiciest, and it should be springy to the touch, not soft, or wilted. Defects on the surface of the fruit such as scars, scratches and discoloration don't affect the sweet juicy fruit taste. Because grapefruit is ripe when picked it will not ripen further once off the tree. Grapefruit will last for several days if stored at room temperature. Otherwise refrigerate in a plastic bag or in the high humidity crisper section of the refrigerator where it will keep for several weeks. There are many ways to eat a grapefruit. The easiest way to enjoy a grapefruit is to slice it in half and eat it by scooping out sections with a teaspoon. You can also slice it into wedges for a snack. Try pulling off the skin and separating the fruit into sections. Fresh grapefruit juice is easy to make for cocktails with rum, gin, and vodka.